Inspiration for the recipes I make comes from all over the place. Cookbooks, websites, restaurants, and sometimes just the people in my life. This cake is an example of the latter. My dad’s fiancée is one of the few people I know that loves chocolate on the same scale as I do – kindred spirits, I tell you. I started dreaming up this birthday cake for her a long time ago. All the components of the cake evolved over several months in my mind, and I was finally able to see it come together in this wonderful creation. The perfect cake for her needed to be super chocolatey, but also a pretty layer cake. For the cake itself I used one of my favorite chocolate cake recipes. 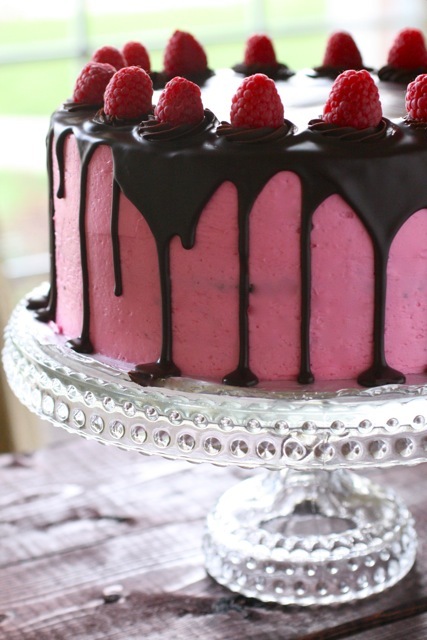 When deciding on a filling, I was inspired to use both dark chocolate ganache and raspberry filling between the layers to make a cake reminiscent of a dark chocolate raspberry truffle. I was originally planning a chocolate frosting or ganache coating for the outside, but then I thought a raspberry buttercream with the chocolate drizzle effect from the tuxedo cake would make for a fun presentation. Some swirls of ganache and fresh raspberries adorning the top of the cake completed the look and effect I was going for. *For best flavor, use fresh organic raspberries. To make the cake, preheat the oven to 350˚ F. Grease and flour the edges of three 9-inch round cake pans, and line the bottoms with rounds of parchment paper. Combine the cocoa and espresso powder in a small bowl. Add in the boiling water and whisk together until smooth. Let cool slightly. Whisk in the sour cream. In the bowl of an electric mixer, combine the butter and sugar. Beat together on medium-high speed until light and fluffy, about 5 minutes. Blend in the eggs one at a time, scraping down the bowl as needed. Beat in the vanilla. Combine the flour, baking soda and salt in a small bowl; stir together to combine. With the mixer on low speed, add the dry ingredients to the mixing bowl in three additions, alternating with the cocoa-sour cream mixture, beginning and ending with the dry ingredients. Beat each addition just until incorporated. Divide the batter between the prepared baking pans. Bake 35 minutes, or until a toothpick inserted in the center comes out clean. Let cool in the pans about 15 minutes, then transfer the cakes to a wire rack to cool completely. To assemble the cake, place one of the cooled cake layers on a cake board or serving platter. Spread ½ cup of the ganache in an even layer over the cake. Using the reserved ganache in the pastry bag, pipe a border around the perimeter of the cake layer. This will act as a well to help hold in the raspberry filling. Spoon some of the raspberry filling inside the ganache border in an even layer. Top with another layer of cake and repeat this process, layering with another ½ cup of ganache and additional raspberry filling. Top with the remaining cake layer. To make the raspberry frosting, combine the sugar and egg whites in a heatproof bowl set over a pot of simmering water. (I use my mixer bowl here to dirty one less dish.) Heat, whisking frequently, until the mixture reaches 160° F and the sugar has dissolved. Transfer the mixture to the bowl of a stand mixer fitted with the whisk attachment. Beat on medium-high speed until stiff peaks form and the mixture has cooled to room temperature, about 8 minutes. (The bowl should be cool to the touch.) Reduce the speed to medium and add the butter, 2 tablespoons at a time, adding more once each addition has been incorporated. If the frosting looks soupy or curdled, continue to beat on medium-high speed until thick and smooth again, about 3-5 minutes more (or longer – don’t worry, it will come together!) Blend in the raspberry puree and vanilla until smooth and completely incorporated, scraping down the sides of the bowl as needed. If desired, tint with pink icing gel to achieve your desired shade. Frost the top and sides of the assembled cake with the raspberry buttercream, smoothing the surface as much as possible. Chill for at least 30 minutes. To make the chocolate glaze, place the chocolate in a medium bowl. Heat the cream in a small saucepan over medium heat until simmering. Pour the hot cream over the chocolate and let sit 1-2 minutes. Whisk until the mixture is smooth and homogenous. Blend in the corn syrup and vanilla. Pour the glaze into a pitcher or measuring cup and let cool for 10 minutes. (Do not let the glaze cool longer or it may become difficult to pour over the cake.) Slowly pour the glaze over the cake, ensuring that the top is covered and the glaze drips over the sides. Let the glaze set about 5-10 minutes. Meanwhile, bring the remaining reserved ganache to a consistency for piping. (You can microwave in 5 second intervals on low power – it won’t take long to rewarm. If you overshoot and the ganache becomes too thin, simply chill again in the fridge or freezer until it is thick enough to pipe.) Transfer the ganache to a pastry bag fitted with a decorative tip. Pipe swirls of ganache around the edge of the top of the cake and top each swirl with a fresh raspberry. Chill the cake until ready to serve.